The day before August 21, 2004, Dhaka city Awami League leaders had an informal meeting with party chief Sheikh Hasina for her directives on the next day’s rally. At the end of the meeting, Hasina, in a lighter vein, asked her party leaders to get a big truck so that most of her senior leaders could stand on it. “Get a table in front of me at the edge of the truck so that no one would fall from the truck should there is any shoving and pushing from behind,” Hasina said, laughing. Never in their wildest dreams did the party leaders imagine that the small table, brought from the Jubo League office, would serve as a temporary shield to protect their party president when grenades would start raining down by the truck on the fateful afternoon of August 21. But that’s exactly what the small table did. The place at the heart of the capital turned out to be a scene of chaos, smokes, screams, and confusion, resembling a set for a war movie. Disjointed limbs and bloody bodies littered everywhere, with sobs of people and mayhem echoing the place. The grisly grenade attack left 24 people, including Ivy Rahman, wife of late president Zillur Rahman, dead and more than 300 others injured. Hasina, then Leader of the Opposition, narrowly escaped the attack, but suffered damage in her right ear. Attackers left the spot without a problem, reportedly with the help of the the law enforcement agencies. The BNP-led four-party coalition was in power. 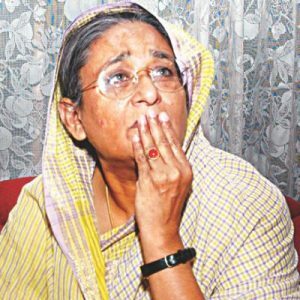 After the attack, Hasina held the government responsible, saying it was a government-sponsored attempt to kill her. She demanded an investigation involving the international community. Moments before the attack, the scene at the AL central office on Bangabandhu Avenue was different. The place was teeming with party leaders, activists, workers and supporters in the sultry and humid August afternoon. Glistened with sweat, they were all listening to Hasina speaking from the truck, holding a microphone. Senior leaders and security personnel were also on the truck, which was used as a makeshift dais. As Hasina was about to close her speech, an explosion occurred at 5:22pm, turning the venue into a ghastly scene of bloody carnage in seconds. “There was a loud boom all of a sudden. We heard two more explosions in quick successions,” said AL leader Mofazzal Hossain Chowdhury Maya, as he recounted the fateful evening and the events leading to and following the day to The Daily Star recently. “Apa [Hasina] took two steps backward. We ducked her beneath the table as a cover,” he recalled. Mohammad Hanif, late Dhaka mayor; Squadron Leader (retd) Abdullah Al Mamun, a member of Hasina’s personal security team; Nazib Ahmed, a cousin of Hasina; and Maya, the then general secretary of Dhaka City Unit AL created a human shield to save Hasina. 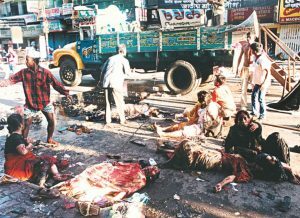 Moments after the grisly grenade attack on an Awami League rally on this day 12 years ago, a few rushed to help the injured — dazed and numb in pools of blood and gore — as bodies lay scattered on Bangabandhu Avenue. “It [creating the shield] was nobody’s decision in particular. We just followed our instinct to save Apa. So that the bullets hit us, not her,” said Maya, now minister for disaster management and relief ministry. Echoing him, Nazib Ahmed said the human shield had been in place for three-four minutes. “When it appeared that she [Hasina] was the target, we encircled her. Nobody gave any instructions about this to anyone. What we had in our mind was to save her at the cost of our lives,” said Nazib, a cousin of Hasina. Hasina was praying herself and asked them all to do the same, he recalled. “If we are to die, we’ll die here; if we are to survive, we’ll survive this way,” said Nazib, quoting Hasina. Both Maya and Nazib said moving the AL chief to safety was the only thing on their mind. They started getting off the truck as the place went quiet for a while, they said. Maj (retd) Shoyeb Mohammad Tariqullah, another security staff, and Maj Gen (retd) Tarique Ahmed Siddique, the then chief of Hasina’s personal security wing, were also there. Together, they decided to get Hasina in her bulletproof sports utility vehicle (SUV), parked around 50 yards from the truck, at any cost. As they took only a few steps, another grenade went off near the truck. They moved back a little, said Nazib. Just then Shoyeb asked others to leave the truck immediately as the fuel tank got leaked and fuel was dripping. Immediately, they got down from the truck and managed to take Hasina to the SUV. Maj Mamun ran to the vehicle and opened its left door. Hasina huddled inside it. Nazib, Tarique, Shoyeb, Mamun and Maya followed. Just then Hasina saw the ghastly scenes. Some of the injured lay on the street bleeding profusely while some groaned sitting on congealed blood and some motionless bodies lay scattered. Seeing the grisly scenes, Hasina wanted to get off her vehicle, said Maya. “My party activists are lying around this way. Where are you taking me in this situation?” he quoted the AL chief as saying. “We replied that let us take you to safety first. Then we will take care of the matter,” said the minister. They asked Hasina’s personal driver Abdul Matin to start the vehicle. But the SUV came under a gun attack. Two bullets hit the left window, by which Hasina was sitting. The front and rear wheels on the left side got punctured by bullets. Still the vehicle moved on, took a left turn to Zero Point and sped away. The vehicle reached Sudha Sadan, Hasina’s personal residence at Dhanmondi-5, around 6:00pm. “Inside the vehicle, she cried and prayed. But she again wanted to know about the party leaders and activists,” Maya recalled. “She even demanded that we take her back to Bangabandhu Avenue,” he said.